Consider what you may learn, if you are open to being wrong. My wonderful friend and amazing comedian, Big Daddy Tazz, posted this conversation he overheard the other day between a grandfather and his grandson. 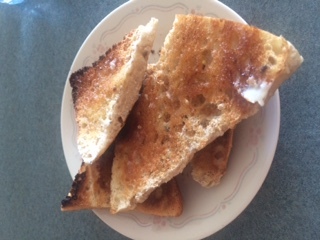 The brilliant Grandfather, being open to a new way of seeing the world – er toast, takes a piece of his toast flips it over puts jam on the unbuttered side. One point for Grandfather – who knows that being right, doesn’t equal winning! Generally, as humans, we like one person to be right and the other person to be wrong. If you are like most – you like to be the one that is right. This week consider that there may be more than one right way to do something. Yours might be right and it just may be one of many right ways. Considering what you may learn, if you are open to being wrong, it’s just one more way you can live Your Life, Unlimited! On this week’s Your Life, Unlimited radio show, we hail to the presidents! Brian Lowes, president of Mercedes-Benz Winnipeg & Stuart Burns, president of SpeedPro Canada – share some of the insights and habits that they employ to create a life of success and significance and to nurture a team that truly wants to follow them. This entry was posted in Blog, Empowerment, Happiness, Relationship. Bookmark the permalink. Previous Previous post: Look Better in the Next Three Seconds! Next Next post: It’s not just about what you do…it’s about what you think.